The graph shows the leading eSports professional players on Twitter worldwide as of January 2016, ranked by the number of fans. 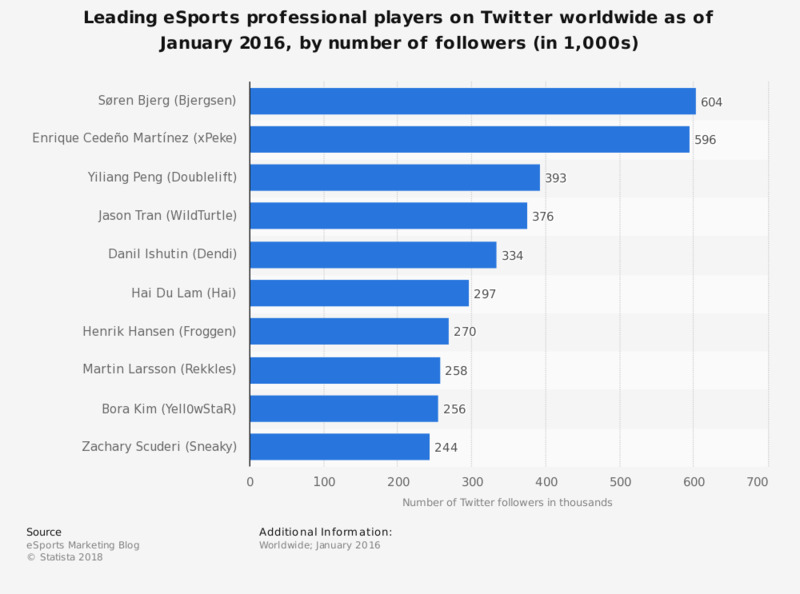 As of the measured period, Søren Bjerg, a player from Denmark also known as Bjergsen, was the most famous on Twitter, with 604 thousand followers. He was followed by Enrique Martínez, aka xPeke, who gathered 596 thousand followers on Twitter. At the same time, Søren Bjerg was also the leading pro eSports player on Twitch, as his channel had nearly 68 million views in the measured period. Surprisingly, among professional players on Facebook, Bjerg ranked last, with 296 thousand fans in January 2016.